2016. New Table Games Showcase. Your Three Card Draw Poker looks interesting. Is 1.04% house edge good enough in UK? not too low? Is the basic strategy intuitive? Three card draw isn't his game, it's a Score Gaming product. Yes, Three card draw isn't My game, it's Score Gaming's product. Sorry to Stephen and Score Gaming. Still, Stephen, you're more familiar with the UK market. Isn't HE 1.04% a bit low? If a game can hold 20+% and Player like it, then it does not matter about the house edge. With a HE 1.04% it would be harder to hold 20+%. 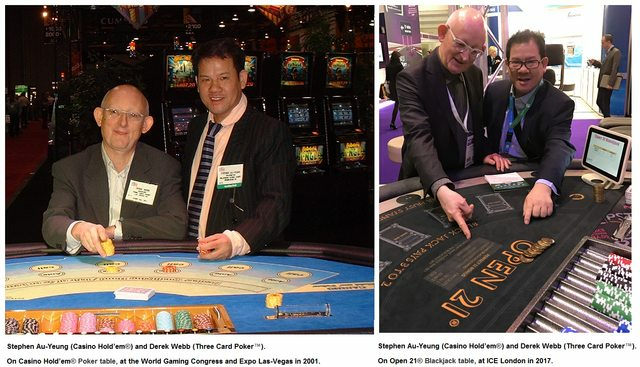 The Top-3 New Table Games inventors on my New Table Game (Open 21®) table, at ICE-2017. 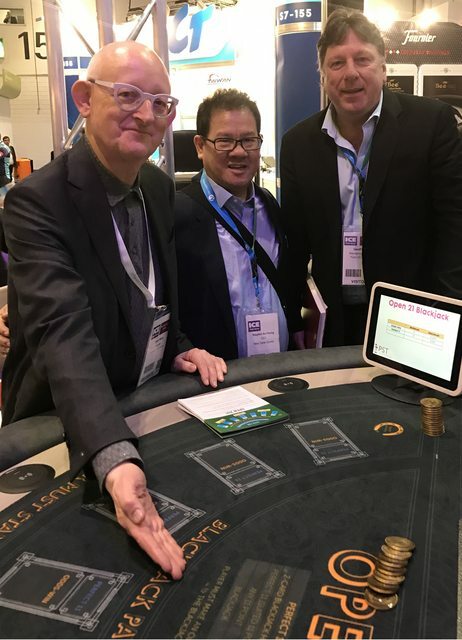 Me (Inventor of Casino Hold'em®) and my two best old friends (30+ Years) Derek Webb (The inventor of Three Card Poker) and Geoff Hall (The inventor of Free Bet Blackjack) on my New Table Game (Open 21®) at ICE-2017. It seems this game is going to be trialled in Southampton starting in a few weeks' time. From what I can gather it plays similar to Three Card Poker except the rank of hands are determined by adding up the points a la Blackjack (Aces=11) and possibly multiplying by a factor - two with a pair and three with trips. The dealer qualifies with 20 and there are bonuses for scores of 61 or more. I've had a quick look at the maths and you probably fold totals of 20 or less, which would be annoying with three 2s! However there is a 3CP side-bet (1 4 6 30 40) and also one for the total you get (e.g. pays 250/1 for 99=three Aces). Personally I think the House Edge is set slightly high, and the bonus should come in for totals of 60 or higher. Also I can see people playing the sidebets, especially the 3CP one, for more than the base game. 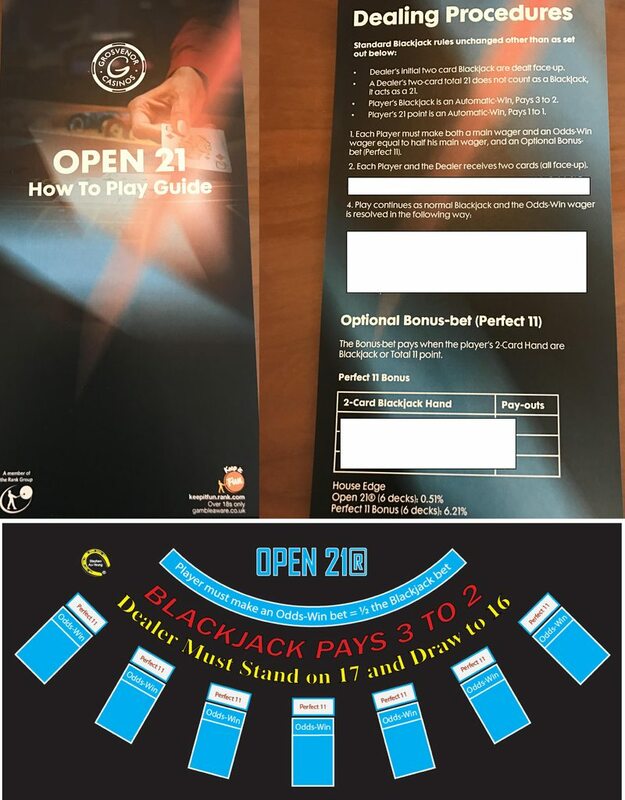 My Open-21® Blackjack will be on trial in Grosvenor Casinos Aberdeen and Grosvenor Casino Bolton UK, on 3-Mar-2017. 1. Dealer’s initial two cards are dealt Face-up. 2. Player’s Blackjack beats Dealer's Blackjack, Pays 3 to 2. 3. Player’s 21 point beats Dealer's Blackjack or 21 point, Pays 1 to 1. 4. If Player's hand ties with the Dealer's hand, the bet will Push. Stephen Au-Yeung (Casino Hold’em®) and Derek Webb (Three Card Poker™). 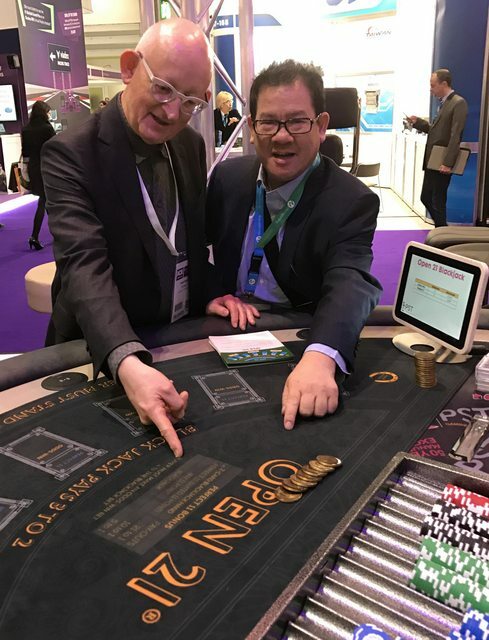 On Casino Hold’em® Poker Table at World Gaming Congress and Expo (Las-Vegas, US) in 2001 and On Open 21® Blackjack Table at ICE (London, UK) in 2017. Both Grosvenor Casinos (Bolton and Aberdeen) in UK, has gone live with Open 21® Blackjack (3/3/2017). Rule #4 is the gimmick. Why is it being hidden? And I'm certain that one rule has to have a large house edge.